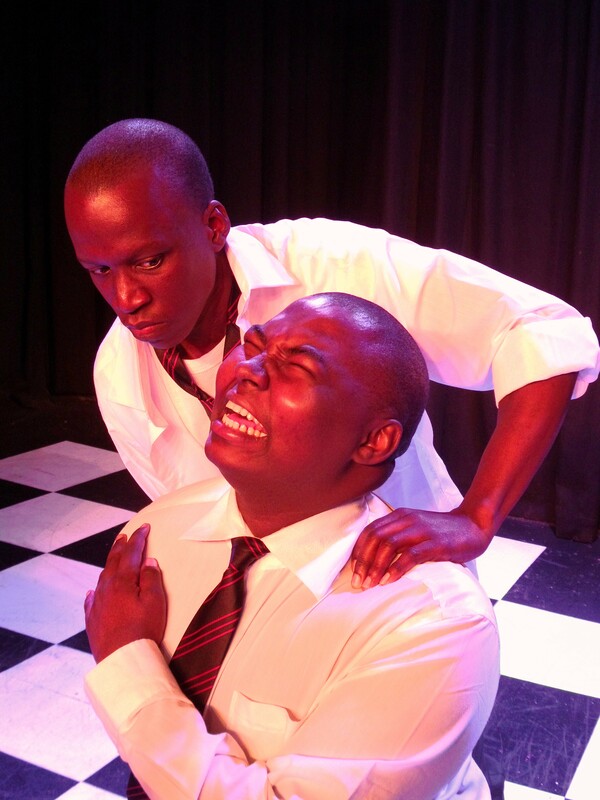 “I’ll show you!” school bully Richie (Letshabang Moshime) tortures his victim Russell (Gamelihle Bovana). Photograph courtesy National Children’s Theatre. What gives HBO tv series Oz its universality, clout and sense of poetry to say nothing of its ability to be watched again and again? Not its explicit violence. It is how each character is crafted as a three-dimensional entity. While it’s not fair to compare The Revealers with Oz, this little play features a handling of the wickedest of characters by a young cast embodying a similar level of poetic and intellectual credibility. A tale of bullying combatted not by teachers or parents, but by the child victims themselves, The Revealers is an empowering and compelling piece of work, brought to believable life with strong performance and wise and simple design. It’s a casually told piece, reaching back through a trajectory of ten years, bringing the cast to the age and stage of Grade 7, which grabs the young audience’s attention from the word go. In the main role, Gamelihle Bovana gives clear flesh and blood to his character, Russell, a boy who gets picked on by the school bullies. Whisking in a reflection on school intranet, the parochial equivalent of today’s social media, the story touches on the value of speaking out, and of using words as therapy. There’s a compelling interweaving of dinosaurs and their habits with that of the most spiteful of the school’s baddies, but also a strong engagement with how the different genders try to break peers they consider a threat: boys with physical violence; girls with destructive gossip. And just when you think it couldn’t get worse with blatant bitchiness by the school’s little übermadam, Bethany played deliciously by Nomonde Matiwane, it does. But the turning point is cast by Richie, the school’s most feared kid. Played by Letshabang Moshime, the role is stereotypical up until the point Russell touches some of Richie’s deeper chords and the child erupts more angrily but also more impotently than ever before. This element remains unspoken of in the play, but it immediately lends Richie that three-dimensionality that enables you to gaze through the bravado and the instilled bruises, the ugly words and threatening hoodie, and see a human being there, who suffers. And in spite of such articulated nastiness that makes it hard to watch, at times, the characters remain true to their child-identities, articulating that resilience children have. With lovely cameo roles by performers including Shika Budhoo, who embodies the thickly authoritarian stance of teachers, who remain impervious to the complexity involved in children’s politics and just punish those she sees being naughty at the time, the work is never preachy. It is informative and engaging, and while it might be a little text heavy for the less-than-11-year-olds in the audience, it offers insight into the National Children’s Theatre opening its doors to teen audiences. Using very clever theatrical devices and a set that could easily be packed into a ordinary car, the work extrapolates on how hard it is to express oneself about as niggly and nuanced an issue as bullying, but also, on how it is never cut and dried and there are seldom obviously punishable baddies in the saga. There’s an element of violence in the piece which is crafted around a teenaged sensibility: enough to get them surprised to see fighting on stage, but not too much that it becomes an inroad to a behaviour. The Revealers, tweaked and shifted from its earlier manifestation, on the boards in February, is a tight and compelling but important piece of theatre that has the power to reach into a young bully or victim’s sensibilities. The Revealers: An Anti-Bullying Play by Doug Wilhelm, adapted and directed by Francois Theron, features design by Stan Knight (set); Jane Gosnell (lighting); and Chriselda Pillay (costumes), and is performed by Taheera April; Shika Budhoo; Gamelihle Bovana; Dhaveshan Govender; Sean Louw; Rhee Manganyi; Nomonde Matiwane; and Letshabang Moshime, at the National Children’s Theatre in Parktown, until August 8.